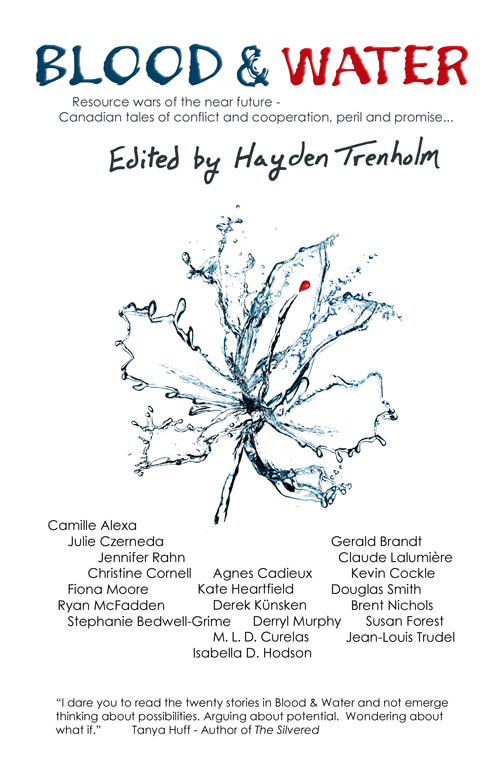 I’ll borrow a favoured term from Margaret Atwood when I say that Blood & Water, edited by Hayden Trenholm and published by Bundoran Press, is a tremendously compelling collection of speculative fiction. The anthology’s theme is one of near future conflicts emerging out of resource scarcity and climate change, all from a Canadian perspective. In the initial call for submissions Mr. Trenholm placed no limits on genre, indeed stating in the book’s introduction that he was open to “cross-genre and even urban fantasy”. By and large, the stories included in the final cut are science fiction of the first order, what some might call “hard” SF, but what I’d rather recognize as the sort of work where the authors very clearly did their homework. While one or two stories do borrow too heavily on the clichés of “Can Lit” the greater focus remains on the fantastic challenges and the no less awe inspiring opportunities that Canada, as well as the rest of the world, will face in the century to come. Although the quality of the writing, even in the stories I didn’t care for, is second to none, this is not an anthology to be read in a single sitting. The visions of the future offered in Blood & Water are, in all likelihood, more in tune to the reality of our world than most people would care to admit. The potential hard truths deserve a moment or two for reflection and exploration after the fact. Where a good friend once told me people read to escape, I would argue there is little sanctuary to be found within Blood & Water. Yet the best stories within this book do not present tales of privation with an accusatory finger pointed squarely at the reader and their carbon footprint. They offer solutions to problems and in doing so they posit on the price that we must pay for sustainability and survival. Considering the background of the authors within this anthology, it should come as no surprise to see the academy as a central setting in a number of stories. Jennifer Rahn’s Phoebastria is memorable in that it takes the concept of the ivory tower, and drops it into a version of Edmonton that is not quite post-apocalyptic but certainly on course therein. The theme of resource conflicts are taken quite literally within this story as a graduate student is exiled from the university into a largely lawless and waterless wilderness. There is some obvious criticism of officious bureaucracy as seen in contrasting graduate student competition with gang loyalties. However, I think the truly interesting message emerges as a discussion on the “knowledge economy” where people cease to be valued as individuals and are instead reduced to their varying skill sets. Bad Blood is unique within the anthology as something that subverts the generally established approach to resource scarcity. Herein the resource is not oil, electricity, or water, but human antibodies. Racism, racial intolerance, and individual rights are juxtaposed against the practical application of a Rousseauian greater good during a viral outbreak. Tales like this also shine a light on the unique hubris encompassing discussions of manmade climate change. As we discuss carbon emissions it is easy to overlook nature as a complex beast capable of striking down humanity at the cellular level. Bad Blood is a viscera filled reminder of this truth, a horrifying voice quietly whispering in the back of our minds that no matter how careful we are, with ourselves, with the planet, we are not safe. More than any other within the collection, this story chilled me to the bone. While others may have used the word “foodlegger” in the past, We Take Care of Our Own was my first exposure to this particular neologism. Heartfield’s story offers a non-cataclysmic breakdown of modern macro agriculture and the subsequent economic protectionism which rises in its wake…and cheese smuggling into New York. Yet this story is more than a parallel of Canada’s dubious past in alcohol smuggling. It frames critical thinking, a politically astute populace, and youthful outrage as scare resources in the face of growing apathy within Canada’s population (Montreal notwithstanding of course). Furthermore, there seems to be a suggestion on the part of the author that a critical mass of people living their lives in a “plugged-in” condition is contributing to a lethargic hive mind like mentality. Pairing this serious dialogue with something as deceptively whimsical as an illicit grilled cheese sandwich allows for fantastic exploration without becoming abrasive or preachy. At first, I did not know what to make of this story. Who would when the first sentence discusses the serious problem of clown farts? Yes, I said clown farts; it’s a significant issue in forestry and bio-fuels. In an anthology heavily invested in exploring problems of a planetary magnitude, Künsken’s story is a necessary oasis of comedy. This does not imply The Parable should be taken any less seriously than the rest of the stories in this book. Comedy by its very nature demands more of its audience than tragedy. The selling point in this case is the author’s deft ability to balance the inherently didactic nature of a parable with poignant absurdity on par with the likes of Terry Gilliam. So what is there to laugh about in sustainable resource development? Quite a lot when we stop to look at short sightedness in the face of long term problems. Many years ago a high school teacher of mine suggested the planet was not over populated, simply unbalanced in its distribution of resources. This was back when Earth’s population was a shade below six billion. Trudel’s contribution to Blood & Water is the perfect response to any such notion, and is ideally placed as the final tale within this book. Though its exploration of shifting population patterns due to climate change is not unique within the anthology, it is the only narrative that looks at alternative fuels, nuclear fusion, and conservation as a stall in the face of the planet’s real problem: humans need to consume things. Layered within its art on art discussion, is a cruel but arguably necessary recognition that humanity may be an overgrown garden in need of pruning. Moreover, Human Garden takes aim at the culture of cognitive dissonance fueling our collective inability to manage climate change. “…people rapidly get used to transformations of their own environment. Much too rapidly, in fact.” Consider well the author’s words as we reflect on this summer’s record breaking heat and water starved crops. There’s little doubt in my mind that Hayden Trenholm has assembled a fantastic collection of highly relevant, but equally accessible stories. Where I’m normally content to recommend an anthology if at least half the content within rates as “decent”, I would call no less than eleven of Blood & Water’s stories outstanding. Of the remaining nine, only four failed to find any real traction with this critic. For those particularly concerned with cost/value equations, I would point out that five of the stories in this anthology are reprints. Yet they are, save for one, very fine contributions which are quite in line with the theme of this collection. For readers with the fortitude to gaze into a future without the comforts of cornucopia technology, a place where perpetual crop shortages and radical climate change are less than a lifetime away, then Blood & Water is a must have. 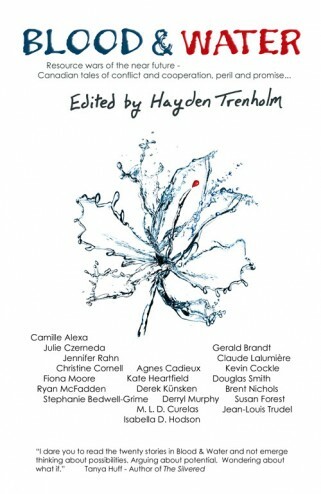 Blood & Water is edited by Hayden Trenholm and published by Bundoran Press.